Fruits have never been this crazy. Funky Fruits Slot Machine gives fruits a nice twist. Check out the free demo version of this game here and see how you can squeeze a tasty victory. No registration required because you can easily access the free game on this page. You can surely get lots of rewards from these funky fruits. Bring back the summer vibe and let the Funky Fruits game give you a refreshing treat. This game, which is powered by Playtech Software, has used the perfect combination for its interface. A view of the beach, a surfing board, and a glass of cold drink compose the design of the screen. The animation of the game is also entertaining as the pile of fruits in the middle makes some funky moves while the game is on standby. On the right side of the screen, you will see the available jackpot prize and your winnings. There is also the option to automate the spin by selecting your preferred number of auto plays. You can customize it by moving the left and right arrows in a multiple of 5. Your bet is also configurable on the same side. Minimum stake accepted is 1 while the maximum is 10. The other side of the screen shows the winning combinations you earned in the surfboard. 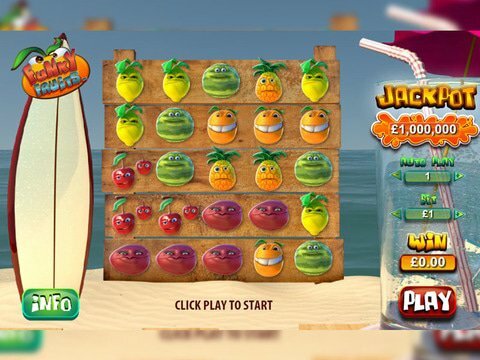 Funky Fruits Slot Machine breaks the usual 5x3 screens. Instead, it uses five columns and five rows and its progressive jackpot makes the game so exciting. Our fruits got their funky faces on. The game features watermelon, plum, pineapple, orange, lemon, and cherries on the board. There is no betting line needed in this game. Your goal is to get the same fruits on adjacent reels. Both horizontally and vertically neighboring fruits are considered as a winning match. Once you get five or more adjacent fruits, you will be given a certain multiplier for your bet. The watermelon pays the least among all the fruits. Matching five or more watermelons offer x0.04 up to x50. To give you an idea, the plum pays up to x100, the pineapple pays up to x500, and the orange pays up to x1000. These amount can be yours if you match 16 pieces of the same fruit mentioned. The highest paying fruit is the lemon which can provide x7.5 at the minimum for five matching icons, and up to x5000 for getting 16 identical icons. To ace the progressive jackpot prize, you have to get at least 8 adjacent cherries on the screen. Cherries can also give you x50 up to x2000 when you get five or more. Jackpot prize in Funky Fruits can go as high as seven digits, so you better keep an eye on that cherry. For a conventional game style, you can try NetEnt's Fruits Evolution Slot Machine. However, the highest prize offered is here lower compared to Funky Fruits. We recommend you playing the Funky Fruits free play slot in the Slots Heaven Casino, which is a top gambling site open for Canadian players. No download is needed and you can even try the game using your mobile devices.